When strolling or slowly driving along the graveled Cuttalossa Road, no one could dispute its fame as one of the most beautiful small valleys in America. Following a gentle stream, with sycamores and hemlocks towering above and hillsides carpeted with wild rhododendron, the experience is one of serenity and oneness with nature. It’s hard to imagine that this tranquil valley was once a thriving industrial center. From the mid 1700s to the late 1800s, the pure cold water of the Cuttalossa Creek furnished power for propelling two grist mills, two saw mills, a bone mill and phosphate factory, and a sash, window, and door factory. At its terminus with River Road, the little village of Lumberton hosted stone quarries. It is said that some 200 people lived here to operate the quar ries and mills. Stone produced here was transported by canal barges to Philadelphia, and later by railroad to New York City, and can still be seen in mansions in both cities. The Cuttalossa Inn served as a general store and post office. 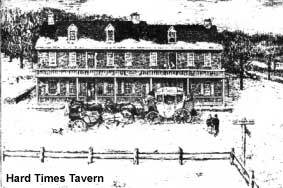 The stone building across from it, built in 1758, was known as Hard Times Tavern–so named because of the tenant’s complaint that the level of business left him unable to pay rent. But prosperity arrived with the completion of the Delaware Canal in 1833, and the inn became the Sign of the Camel. Later turned into a private residence, artist William Francis Taylor lived there for most of the first half of the 20th century. The most famous resident of the valley was General Zebulon Montgomery Pike (1779-1813) who gave his name to the peak he discovered in Colorado. He spent his early youth in the valley and attended the one-room schoolhouse in Solebury village. who lived on Cuttalossa Road, researched and wrote extensively on its history. An engineer by trade, Duval’s detailed drawings of the mills and mill races have been reproduced in Will Rivinus’s book Cuttalossa, from which this summary has been derived. 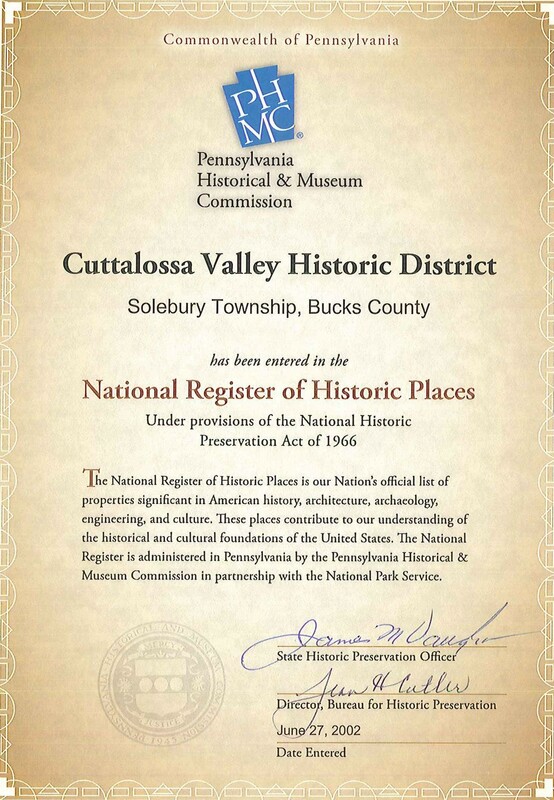 The Society, with the help of the Friends of Cuttalossa, obtained National Historic District designation for the valley in 2001. 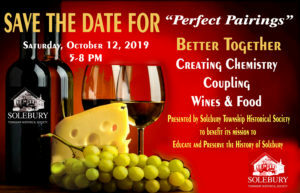 Read more about Cuttalossa on the Solebury Township site.